Charles Cundall (1890-1971) - painter, potter and stained glass artist, born in Stratford, Lancashire. After working as a designer for Pilkington's Pottery Company under Gordon Forsyth, Cundall studied at Manchester School of Art, obtaining a scholarship to the Royal College of Art, 1912. 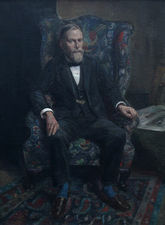 After World War I army service he returned to the Royal College in 1918, then from 1919 to 1920 attended the Slade, and furthered his studies in Paris. Cundall travelled widely in several continents and became noted for his panoramic pictures, such as Bank Holiday Brighton, in the Tate Gallery (accession no. NO4700). He was a member of NEAC, RP, RWS and other bodies and was a prolific RA exhibitor. He had first solo show at Colnaghi 1927. He was an Official War Artist in World War II, during which time he was sent to Quebec (1944). In the same year he was elected RA. His wife was the artist Jacqueline Pietersen. His technical facility - especially when working on large panoramic canvases - was remarkable. His pictures are rich with texture, light and movement. He was equally at ease with aerial views, landscapes, seascapes and cityscapes, and was a master of crowd scenes. His work as an Official War Artist has never received the attention it merits.